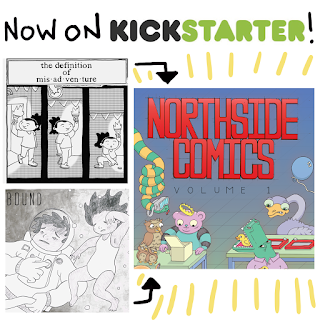 Live, From Chicago, It's The Northside Comic Artists Kickstarter! Sorry for the delay in posting this, but earlier this week the Kickstarter for Northside Comic Artists' newest anthology launched. I've been a member of the collective for almost a year and a half now. 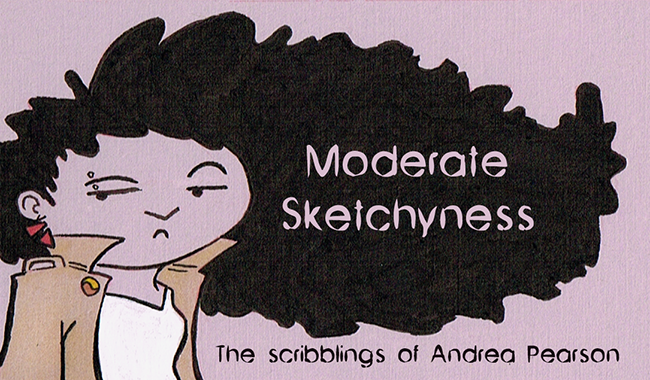 They are a group of awesome artists and writers from the Chicago area who get together and make comics. Over the years they've published four anthologies with different themes. And now the fifth anthology "Memories" is being funded on Kickstarter. 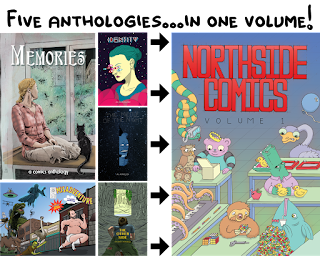 Along with the "Memories" they are also hoping to fund the printing of a complete collection of all the anthologies in one book called "Northside Comics Volume 1". I'll have two comics in this collection: "The Definition of Mis·ad·ven·ture" a story I wrote/drew for "Misadventure" and "Bound" a story I wrote/drew for "Memories". If you are reading this I hope you consider helping us back this project. It would be so awesome to see all of the creators who have worked with Northside Comic Artists over the years collected in one book. Lastly, if you have been wanting copies of "No Pants Revolution" 1, 2 and or 3 and my "Mito and Me" kids comic, then you are in luck. 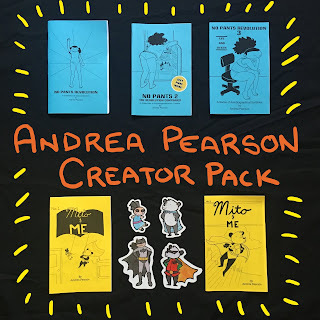 If you back the "Andrea Pearson- Creator Pack" level of the Kickstarter, you will receive a copy of "Northside Comics Volume 1" along with copies of "No Pants Revolution" 1, 2 and 3; "Mito and Me" 1 and 2; as well as some cool "Mito and Me" stickers for only $50! Thanks for reading. Click here to contribute! If you want to learn more about this Northside Comic Artists, this book we're Kickstarting and the creators involved, check out http://northsidecomics.org/ I will be updating their blog everyday of the Kickstarter with info about our awesome creators and some of the cool events we will be attending over the next month.